Junior Robert Duax scored a game-high 23 points to lead UW–Platteville to a 74–64 WIAC victory over visiting UW–Eau Claire. The Pioneers improved to 12–1 overall and 2–0 in conference. 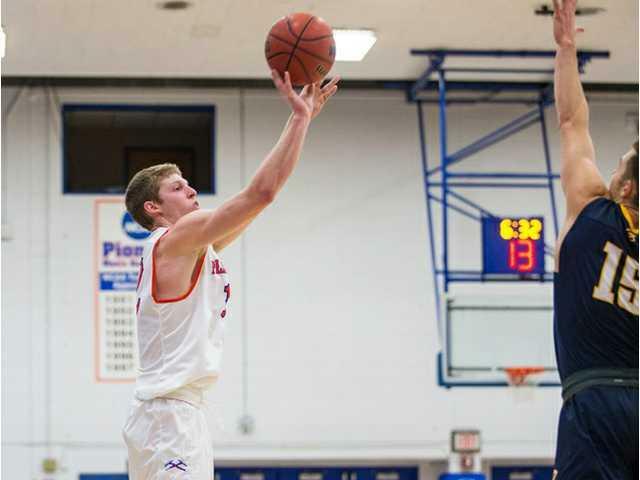 POSTED January 10, 2018 3:00 p.m.
PLATTEVILLE — A great start to the UW–Platteville men’s basketball season continued Saturday night as the Pioneers knocked off UW–Eau Claire 74-64 in their Wisconsin Intercollegiate Athletic Conference home opener. Senior Jake Showalter scored the game’s first nine points to give UW–Platteville (12–1, 2–0 WIAC) a 9–0 lead over the visiting Blugolds (8–5, 0–2) just 78 seconds into the game. That lead was extended to 14–0 on a pair of baskets by Robert Duax and Matt Oestreich. The Pioneers pushed the lead to as many as 20 points, but a surge late in the first half by the Blugolds got them within 11 at the break at 43–32. UW–Eau Claire cut into UW–Platteville’s lead several times in the second half, but could never overtake the Pioneers. UWP was up two with just over four minutes remaining, but outscored the Blugolds 11–3 to finish the game. Duax led all scorers in the game with 23 points. Showalter finished with 18 on 3 of 4 shooting from behind the arc and a perfect 3 of 3 from the free throw line. Carter Voelker added 11 points and led the team with eight rebounds and four assists. Oestreich finished with 10 points. UW–Platteville never trailed as it won its WIAC opener Wednesday by beating UW-Stout 73–54 Wednesday in Menomonie. The Pioneers, who received votes in last week’s D3hoops.com poll, improved to 11–1, while the Blue Devils fell to 6–6 after the first conference game for both teams. Leading 5–4, the Pioneers rode three-point baskets by Voelker, Duax, Jake Showalter and freshman Quentin Shields for a 17–8 lead. UW–Platteville led 39–25 at the half and never let UW–Stout closer in the second half. Two Colin Connelly free throws gave the Pioneers their largest lead, 66–41, with 3:57 remaining. Voelker led a balanced Pioneer attack with 14 points, while Duax and Matt Oestreich each scored 11. Eleven different Pioneers scored and 19 players saw game action for Coach Jeff Gard’s squad, which committed just nine turnovers. Zach Dahl led the Blue Devils with 14 points. The Pioneers travel to UW–River Falls (10–2, 1–1) tonight to take on an Falcons team that reached the second round of the NCAA Tournament last season. The game begins at 7 p.m. in the Falcon Center. UW–Platteville (11–1, 1–0) — Jake Showalter 8, Matt Oestreich 11, Robert Duax 11, Carter Voelker 14, Clay Gerds 7, Alex Ranney 5, Quentin Shields 8, Tanner Hudziak 2, Harold Fay 2, Colin Connelly 4, Justin Jarvensivu 1. Totals — 27-54 10-16 73. UW–Stout (6–6, 0–1) — Zach Dahl 14, Isaac Elliott 6, Sam Ortmann 7, Joe Duty 9, Adam Mackey 11, Brandyn Chrisman 2, Jon Ciriacks 2, Tanner Schmitt 3. Totals — 21-52 9-12 54. 3-point goals — P: 9 (Showalter 2, Oestreich 1, Duax 1, Voelker 2, Ranney 1, Shields 2), S: 3 (Duty 1, Mackey 1, Schmitt 1). Team fouls — P: 15; S: 18. Fouled out — none. UW–Eau Claire (8–5, 0–2) — Sean Miller 4, Chris Duff 11, George Diekelman 19, Cole Rabedeaux 9, Dan Becken 13, Ben Widdes 4, Clay Kujawa 4. Totals — 26-61 2-4 64. UW–Platteville (12–1, 2–0) — Jake Showalter 18, Matt Oestreich 10, Robert Duax 23, Carter Voelker 11, Alex Ranney 3, Quentin Shields 9. Totals — 23-51 21-25 74. 3-point goals — EC: 10 (Duff 3, Diekelman 3, Rabedeaux 1, Becken 3), P: 7 (Showalter 3, Duax 1, Voelker 1, Ranney 1, Shields 1). Team fouls — EC: 19; P: 11. Fouled out — EC: Duff.